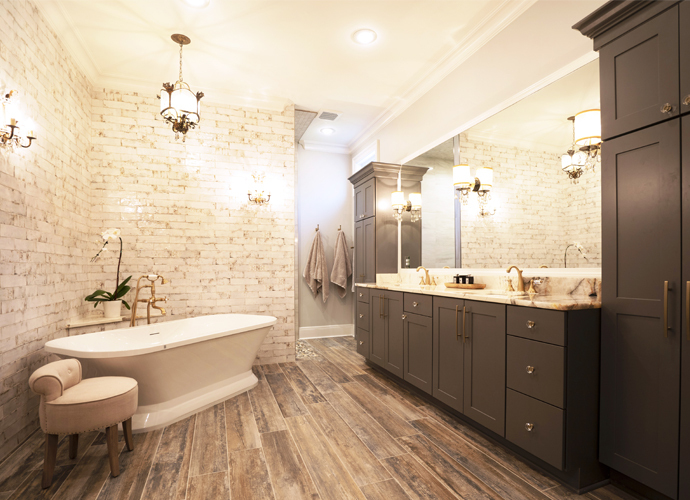 “I never thought I was a Beau Chene person until I walked into this house,” says homeowner Michelle Sunseri of the residence she and husband Doug recently remodeled together. Her sister, who has lived in that area for years, was campaigning for them to find a home close to her when they began house-hunting. Finding this place at the end of their search, after residing in the home she was left by her late husband, was a gift to their blended family. “Our family tree is a bush,” she smiles. With five children between them, ranging from young adulthood, law school, college and high school, their dream home had to be roomy and comfortable, but not so large that they’d never see one another when everyone is home. Michelle runs the northshore branch of the law firm she co-owns with Doug, while he runs the southshore office. Taking on a full remodel–a total gutting and rebuilding–of a house in the middle of daily life was no small feat, but they’ve accomplished more than what they set out to do. Michelle is proud to have done the contracting and project management herself for the remodel. “I have learned so much about how things are made,” she says humbly. It’s obvious that the undertaking was a passion project for her, and it has resulted in a place she truly feels proud of. Taking on a project of this magnitude would never have been possible without the help of a talented carpenter, and Michelle raves about the team she found. Over the course of the project, they have become like an extended family. “I would come over after work to see the progress, and just sit outside under the big oak tree,” she says. Over appromimately six months of work, enormous changes have been made. From the first visit to the house, the couple knew they wanted to open up the floor plan and lighten the palette. A thirty-foot wall was demolished, and in its place now stands a bricked archway that is strengthened by a steel beam. Here, where the smooth wood flooring of the living and kitchen spaces seemlessly blend, light pours in from the breakfast area windows, keeping heavy-texture materials airy in feel. The older, typically 1990s-era wood stair railing was replaced by wrought-iron spindles that emphasize the beautiful curve of the entry hall stairs. A single piece of statement art by a Louisiana painter perfectly punctuates the space, and sets the tone for the rest of the house: it is all elegantly simple, with thoughtful detailing. Of all the decisions that were made for the home, one stands out as the easiest: the Patagonia quartzite used for the kitchen counter. Michelle fell in love with it early on in the project and wouldn’t consider using anything else. The hardest? Finding the right white paint for the walls! “We probably went through fifty sample jars of white paint!  There were swatches everywhere, and each was a little different.” Finally settling on Sherwin-Williams Pure White, the wall throughout the house were all sprayed the same color. This creates a bountiful, oxygenated feel from room to room, as though you can breathe more deeply inside this home than you can outside in the heavy Louisiana air. Michelle spends as much time as she can in the petite sunroom off the kitchen, from where she can see outside and inside all at once. 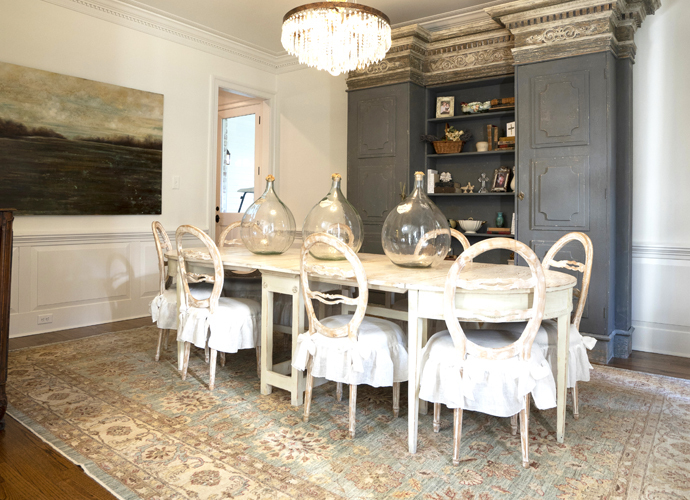 Loads of sunlight fill the room, where she used French-inspired furnishings in a tidy, neat way to achieve a timeless ambience, with bits of Louisiana flavor mixed in. 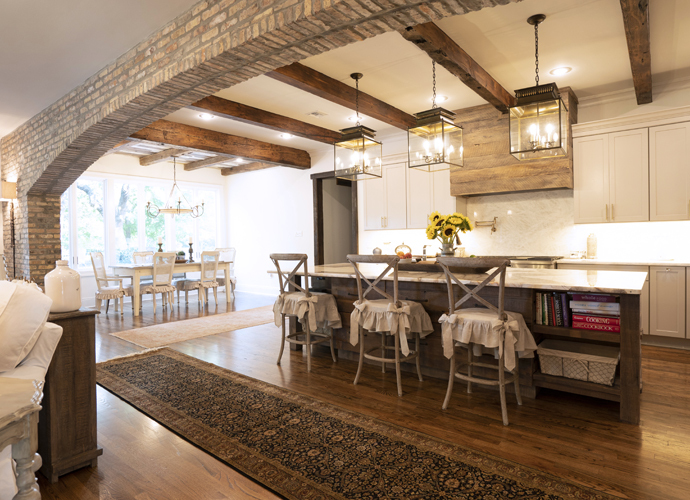 Cypress beams in the kitchen give an architectural rhythm to the heart of the home. Large-scale lighting and Shaker-style painted cabinetry combine in a crisp balance for a clean, tidy, warm family space. A hallway is lined with antique doors, each one different, adding a bit of surprise to the story of the home. In the master suite the color palette remains neutral while the textures take over. 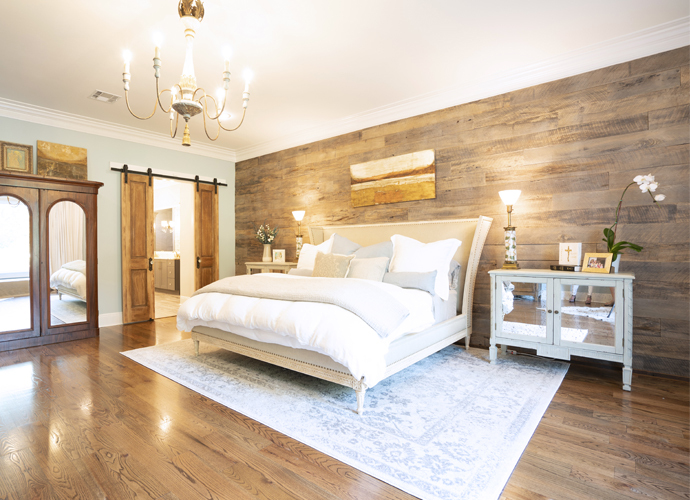 The bedroom sports a beautiful focal wall of reclaimed wood and a pair of rustic sliding doors to the bathroom, and the classic furnishings provide the balance needed to create a luxurious and restful suite. A bit of sparkle from the mirrored nightstands adds a hotel-style touch. Behind the footed tub, a mortar-washed brick wall plays with light and shadow. Though the room is largely open, the feeling is enveloping and warm just like the family who lives here.